This Dual Monitor LCD Stand has a Reverse Base Design. 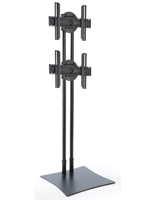 These Digital Display Stand Include two Mounting Brackets for Extra Advertising Space! This Dual Monitor LCD Stand is Ideal for Retail Stores! 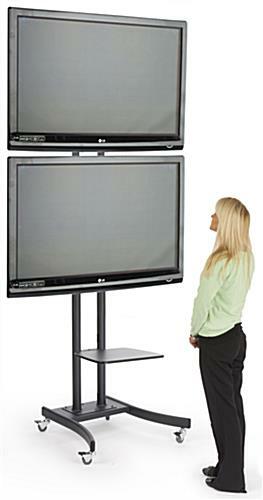 TV Size: fits most 32"-65" flat screens weighing less than 175 lbs. each. Includes 4 caster wheels (2 locking) for easy mobility and stability while in use. In-post cable management for hiding wires. Mounting posts have 10 set height adjustments from 50" to 90-1/2". Black finish for a sleek stand that suits many environments. 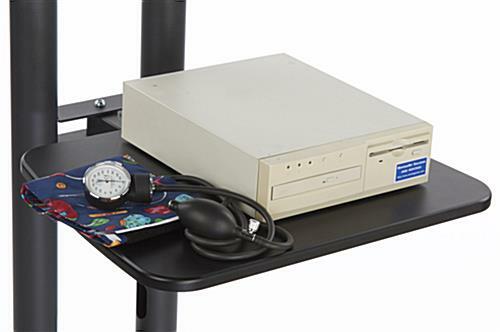 This dual monitor LCD stand rear wheels make this item move with ease. 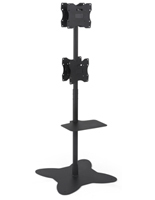 This floor standing tv holder has a black finish to suit many environments. This multiple mount TV rack, dual monitor LCD stand that holds 2 screens up to 65" in size provides plenty of room for digital signage. 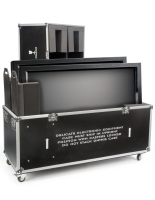 These multiple mount plasma racks are ideal for displaying digital presentations to grab the attention of customers. This dual monitor LCD stand that displays flat panels one above the other is an eye catching display. The 4 locking caster wheels provide easy maneuverability and also stability while the television holder is in use. 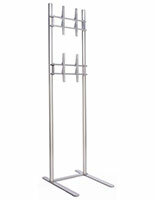 Tradeshow exhibits can benefit greatly from this dual monitor LCD stand with many great features. 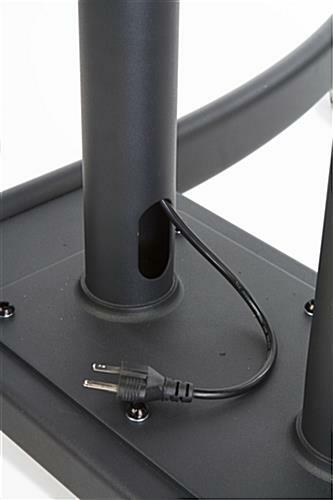 In-post cable management ensures wires stay hidden and organized. This dual monitor LCD stand provides ample real estate for digital marketing materials. This display has two mounts one on top of the other to save space and allow users to showcase multiple presentations at once. This dual monitor LCD stand requires assembly and comes with easy to follow instructions. 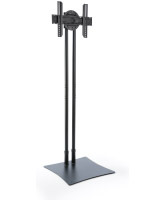 This black finish floor standing mount is great for high traffic areas as it is durable. This dual monitor LCD stand can meet most height needed! The easy to use bracket is VESA compatible so nearly any flat screen will fit. 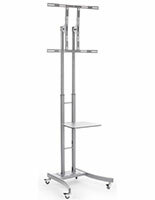 This portable dual monitor LCD stand is ideal for tradeshows or other establishments where maneuverability is of high importance. 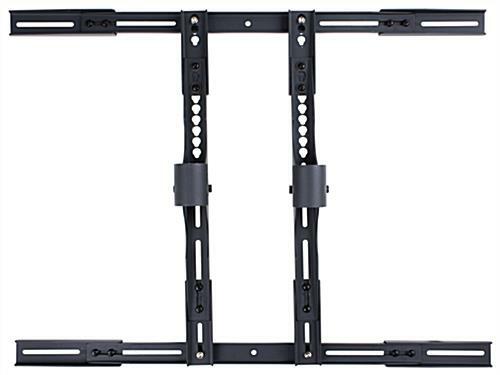 This mount comes with a vast hardware kit for mounting a flat panel but customers are responsible if special screws are needed. This double mount led display has a modern design. The 8 height adjustable settings are convenient when needing to change the viewing level of the screens. 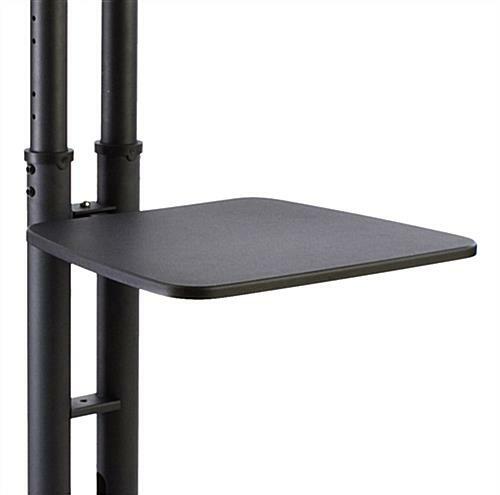 This floorstanding display is equipped with a VESA compatible mounting bracket. 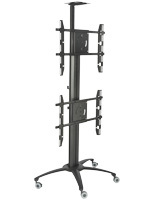 This TV rack is compatible for VESA mounting patterns from 200mm x 200mm to 900mm x 600mm. Two screens help users advertise to a larger demographic of people at one time. 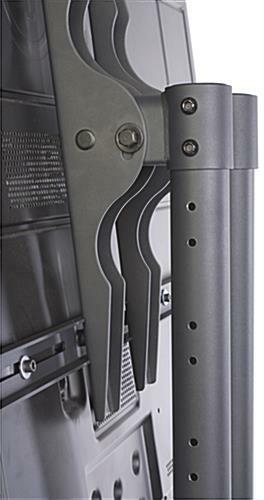 The height adjustable settings go from 54" (to center point of top bracket) to 90". The brackets can be mounted where needed along the posts so users can set at the ideal viewing height.